In the past decades, efforts to fight corruption have increased across the globe. At a closer look not much evidence can be found to prove these strategies to be successful. We are still facing the same questions: Why is it so difficult to overcome corruption and what measures need to be taken to majorly improve the situation? ANTICORRP researchers across Europe are constantly trying to answer these questions through research, looking for evidence on which anti-corruption strategies work and under what circumstances. 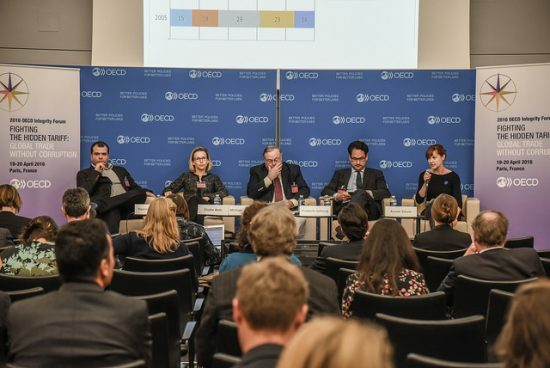 19-20 April, ANTICORRP policy pillar leader Alina Mungiu-Pippidi and senior researcher Ramin Dadasov took part in the 2016 OECD Integrity Forum. It brought together some of the most important policy makers in the anti-corruption industry. Alina presented her latest book, “The Quest for Good Governance: How Societies Develop Control of Corruption”, taking stock of 30 years of anti-corruption policy making and deriving lessons learned from those countries that managed to transition into a system of ethical universalism. Ramin presented the Index of Public Integrity (IPI), which was officially launched by the European Research Centre for Anti-Corruption and State-Building (ERCAS) and ANTICORRP in May 2016. The index presents a new way of measuring public integrity systems and the ability of 105 countries to control corruption. It does so through six individual components which are all highly associated with the control of corruption, but are more objective and actionable than previous measurements. Ramin presented the IPI at panel on using integrity data for anti-corruption policy-making, showing how much work is still needed for solid, evidence-based policies. On invitation of The Netherlands EU Presidency 2016, Ramin Dadasov also presented the IPI at a workshop on good governance, which took place in Brussels on 27 May 2016. The workshop targeted representatives from all EU member states. Ramin presented the IPI in the context of a report on “Public Integrity and Trust in Europe,” which ERCAS launched with the Dutch Presidency earlier this year. The report argues that a lack of public integrity and institutional quality is a major explanation for the declining trust in public institutions in Europe. On 28 April 2016 Brussels-based economic think tank Bruegel hosted an event titled “Fighting corruption: from headlines to real impact” featuring researchers Mihaly Fazekas and Alina Mungiu-Pippidi, as well as Transparency International (TI) representative Carl Dolan titled to talk about these questions. Together, the experts discussed the meaning behind different measurements of corruption and what conclusions they offer to support policy makers in their attempts to design better anti-corruption instruments. In the discussion, Alina Mungiu-Pippidi also pointed out the need for better instruments to measure change. Indicators need to be modified in order to have more objective insights into corruption. According to Mihaly Fazekas, the trend towards open and big data helps researchers systematically collect and analyze previously undisclosed data. He highlighted Public procurement as a good proxy for uncovering corruption, as its data helps trace preferential treatment. The Horizon2020 DIGIWHIST project puts together data on companies who win many contracts with public funds. This data is then matched with connections between politics and business to identify companies with political ties and the conflict of interest (COI) is measured. 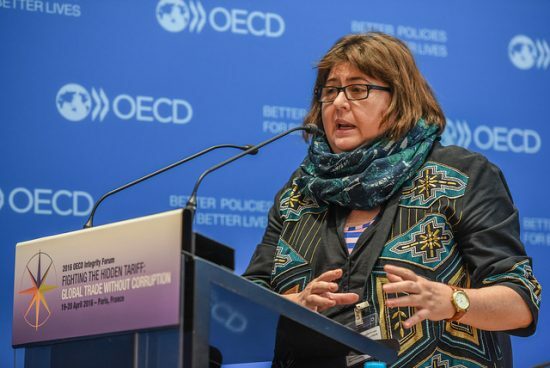 The importance of procurement data was also highlighted by Alina Mungiu-Pippidi in a presentation at the EBRD’s 2016 Annual Meeting, which took place 11-12 May in London. She presented how civil society actors can make procurement more transparent and uncover corruption risk in awarding public contracts. In doing so she highlighted important work done by the DIGIWHIST project and by ANTICORRP partner Romanian Academic Society (SAR) in Bucharest. Government favouritism is still seen as “rule of the game” by many citizens in Europe and other parts of the world. The need for more evidence-based policies is thus clear. New measurements and insights are a first step for these reforms. As the ANTICORRP project we are happy to frequently have the opportunity to present the research that we produce.